Ideal for worship, prayer, meditation and casual listening, The Chants of the Mary features timeless chants, expert vocal performances and beautiful choir arrangements. 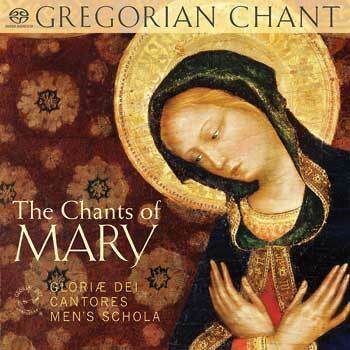 Sung by the Gloriae Dei Cantores Men's Schola, this collection of Gregorian chants is a touching expression of love and devotion for Mary, Mother of God. These ancient songs of faith include the Stabat Mater, the Marian antiphons for Compline, and selected propers from the Feasts of the Immaculate Conception, the Nativity of Mary, the Annunciation, the Visitation, and the Assumption. Ideal for worship, prayer, meditation and casual listening, The Chants of the Mary features timeless chants, expert vocal performances and beautiful choir arrangements. Sung by the Gloriae Dei Cantores Men's Schola, The Chants of Mary is a touching expression of love and devotion for Mary, Mother of God. These ancient songs of faith include the Stabat Mater, the Marian antiphons for Compline and selected propers from the Feasts of the Immaculate Conception, the Nativity of Mary, the Annunciation, the Visitation, and the Assumption.